➤ Upon arrival you will be welcomed by our representatives at the arrival hall and take you to the hotel for check in. You will then have an overnight stay at the hotel. ➤ After breakfast, we begin to visit Angkor Wat - One of the seven wonders of the world famous for its beauty and splendor and was known to be a World Heritage Site since 1992. ➤ Lunch will be served at local restaurant. 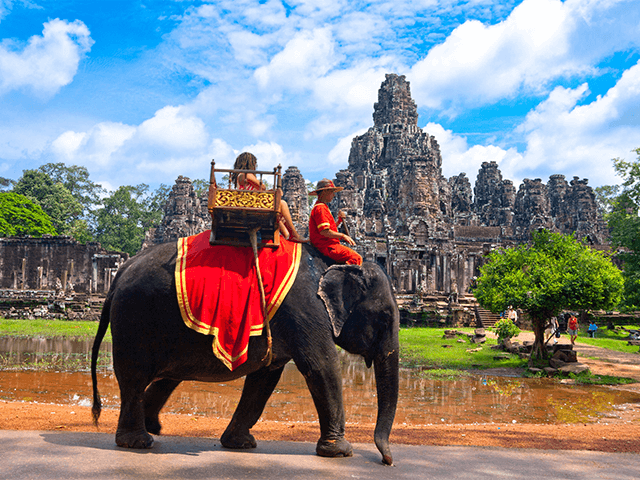 ➤ After lunch, you will pay a visit to the South Gate of Angkor Thom which consists of Bayon Temple, Bapoun Temple, The Elephant Terrace and The Terrace of the Leper King. ➤ Continue to Ta Phrom, another Buddhiest Temple covered by dense tropical forest where Tomb Raider Movie was filmed. Visit Banteay Kdei, a grand Buddhist temple built in late 12th century. Lastly, visit Sras Srong, 1000 year old man-made lake. ➤ The tour continues with the sunset viewing on top of Pre Rup Temple. ➤ Tonight, enjoy Buffet Dinner Khmer with Traditional Show at local restaurant. ➤ After breakfast, excursion to Chong Kneas Floating Village. Then take a ride on a traditional wooden boat through Tonle Sap Lake to experience the fisherman life. In the wet season, the Tonle Sap Lake is one of the largest freshwater lakes in Asia. ➤ Back to town, enjoy duty free shopping for international brand products at the T Gallery by DFS. Lunch at local restaurant. ➤ After lunch, will be a set aside time for you to explore on your own leisure and dinner will be at your own expenses. ➤ Overnight stay at hotel. ➤ After breakfast, you are free to explore on your own. You will then be transferred to the airport for your onward flight. • 3D The Angkor Wat Kingdom only RM1288 wt Flight Inclusive now! • 4D Best of Siem Reap only RM1488 wt Flight Inclusive now! • 5D Best of Cambodia only RM1888 wt Flight Inclusive now!